Games saturate our media like never before, jockeying with each other in our physical and digital worlds for our attention. Billboards for triple A games demand to be noticed along freeways while Game of War and Candy Crush creep along the bottom of every app and website. Even indie games aren’t immune to the hype train, each of them clamouring to be heard in the sea of other small fish. So its both refreshing and disconcerting to come across a game that seems unconcerned with its own impenetrability. 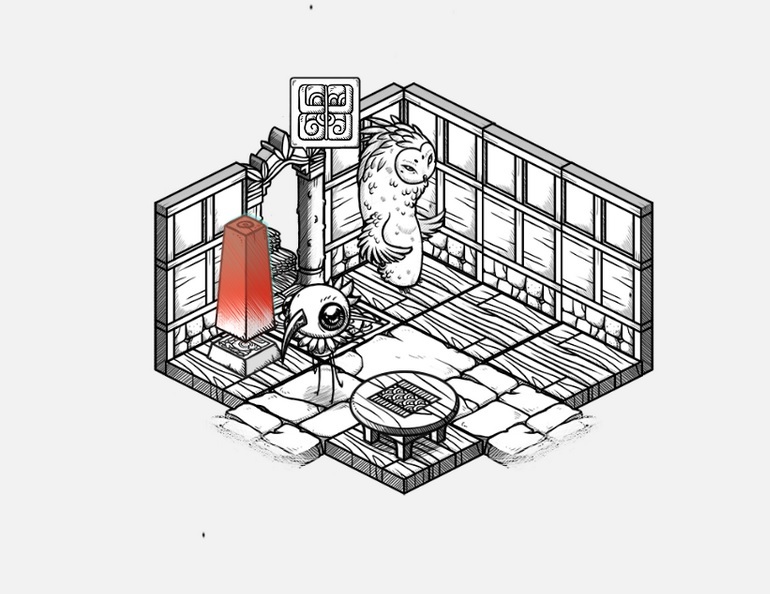 In fact, Oquonie seems to resist discussion about it by its very design. The game first came across my radar in February of 2014, when a Kill Screen email recommended it as “what would happen if Animal Crossing started taking college classes on dadaist poetry and surrealism.” It is (might be?) a complex puzzle game with a beautiful ascetic and some weird music. The game is played on mostly monochromatic 3 x 3 grids that comprise much larger map and populated by indescribable creatures who speak only in strange hieroglyphs. The goal seems to be to collect 3 tiles which transform the player into one of several unique bizarre creatures. Each unique creature allows the player to explore new areas of the map. The object seems to be to meet (or acquire, its not super clear) red pillars scattered around the map. The first few “levels” (honestly I don’t know how to formally refer to progress in this game. States of being? Journey of self realization?) 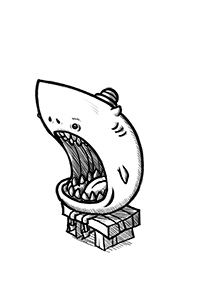 were straightforward enough, until I talked to a shark that made me start the whole thing over again. Insight into the mind of the developer. This is a game that relishes the discomfort of post-modern art, and that dares you to try to make sense of the sum of its parts. The game isn’t particularly concerned with its “game-i-ness”. It discards the notion that time spent with a player will become a master of the internal systems of the game. As I discovered first hand, Oquonie becomes more opaque as I spend more time with it. By its very nature, a game is a world governed by a strict system of rules. Usually, it is once we learn that structure that we can make meaningful choices about our play. Rather than instruct the player of the systems and rules of the world of the game, Oquonie becomes more unclear as more time is spent with it. The further the player progresses, the higher the stakes are, and the more frustrating failure is. The game offers no hints as the correct order of transformation, and it is only through trial and error (or the use of a walk through) that you can hope to complete the game. In a formal sense, the game follows the lead of surrealist artists. The game’s purpose is obscured, the logic of the game is unclear, and the game seems unconcerned the player’s confusion. The understanding can only come from considering the parts of the game singly, as they are presented. Is this helpful? I don’t know, but it sounds nice. After playing off and on for the past few months, I thought I finally had a handle on things. The levels of the puzzle are complicated, but not completely impossible, and after lots of trial and error, I was fairly certain that I had gotten the hang of it. Then I saw that a new DLC had been released. I think I’m back to square one. 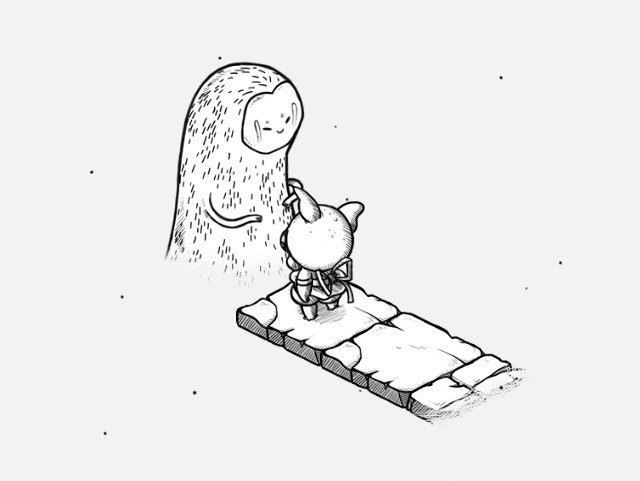 Oquonie is avaliable for purchase in the iTunes app store. Previous Post Did Shinji Mikami Bring Survival Horror Back?